March, 2012: Adam: Man or Myth? “All Mankind, Descending from Him ...”? 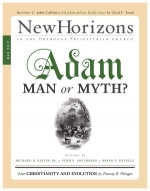 by Richard B. Gaffin, Jr.
Should We Still Believe in a Historical Adam? The title above, as many readers will recognize, is from answer 16 of the Westminster Shorter Catechism (and Larger Catechism 22). It expresses a central truth of Scripture and reflects the universal confession of the church about Adam. News media report confident claims about human origins. Science, it is said, has shown that the human race had a gradual, evolutionary origin—not a single ancestor, Adam. If we are followers of Christ, how do we treat such claims?